If someone shows interets in my story and listen to me carefully, it will be my pleasure. This time I felt so very much. The day before we met, they visited Golden Pavillion, Ryoanji rock garden and Ninnnaji temple by bike. Before meeting, I heard that they had planned to visit Nara and Uji the day before. Secretly I planned to take them to the same area on our tour. I replanned the tour along with their request after meeting, which made us take an unusual tour course. The first leg of the tour was phylosophy path. 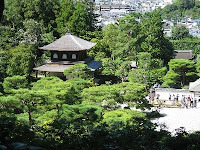 I suggested visiting Ginkakuji temple before walking the path. To tell the truth, I like Ginkakuji better than Kinakuji. 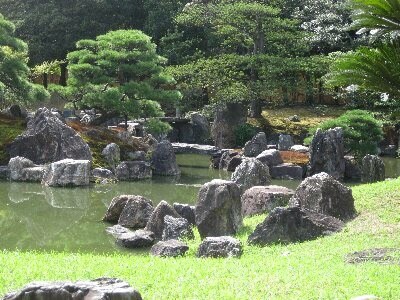 Of course, Kinakuji is very gorgeous and worth seeing. 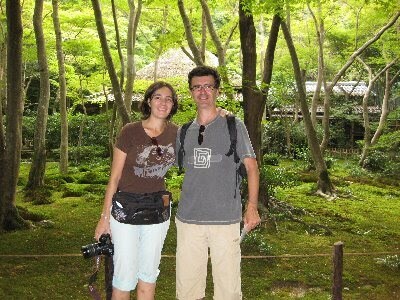 However, I can feel oldness and authentic beauty of Higashiyama culture in Ginkakuji. In addition, you can see the sand garden depicting the moon and the lake and the ground covered with moss along with the pond. After vistiing the temple, we walked along Phylosophy path. 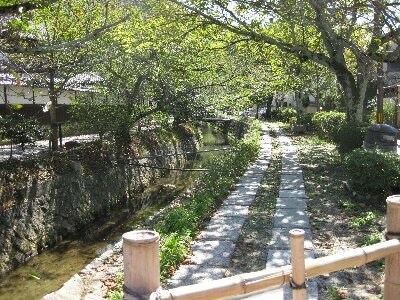 This path is beatiful in cherry season and autumn colored season. It was not in such a season, but just taking a walk was enjoyable. 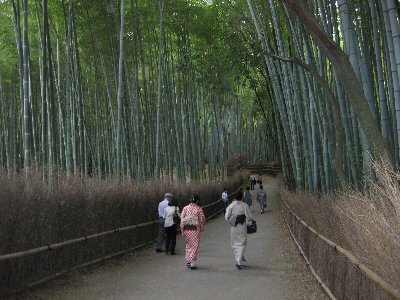 We talked a lot waking along the path, and they listened to the topics in variety. 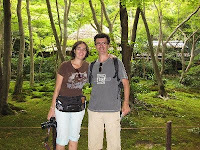 The day before, they missed Nijo castle due to their late arrival. The second leg was Nijo castle. I explained how Samurai appeared, why Shogunate system started, why the last shogun of Tokugawa decided to return the power to the Emperor and so on. They really listened to my story with interests. At the private section of Shogun in the buiding, I talked about the system of so-called O-Oku, the women's area of the castle,and the wives of Shogun. Then, we headed for Arashiyama to see and walk in Bamboo forest. When we entered the forest, they said it was a different world. Just before that, we were walking in the crowd. The atomosphere was quite different. 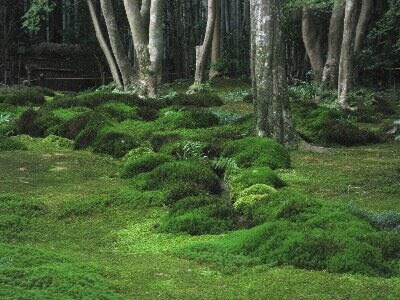 We took the course to Gioji, which has a small moss garden. A few days before it rained much, so it was more beautiful than when I came last. We taked about the sad story of Gio, and we thought about how she felt at that time. Then we visited Rakushisha. 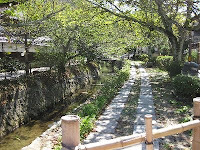 When we arrived here, I explained it is a second house of Mukai Kyorai, a student of the great poet, Matsuo Basho. To my surprise, he knew about Basho and Haiku. 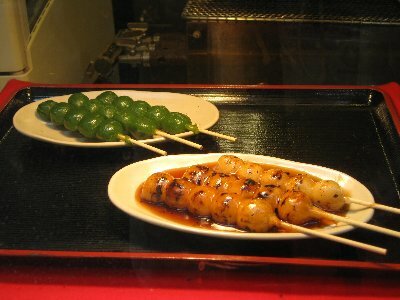 Haiku is a kind of Japanese poems. It consists of 5 moras(syllable) and 7 moras and 5 moras. It is not long, and a deep meaning or feelings must be in this short poem. When we read the poem, we imagine how the poet felt, what the scene is like and secret meanings in it. It is hard to understand but if we can know the world of poems, I think it is more interesnting. This time, they asked many questions and paid attention to various things like our culture, history and usual life. Sometimes it is hard to explain all of them. But it was very fun to me.